I read this article and found it very interesting, thought it might be something for you. The article is called Jobs Decline In India’s Biggest Employment Arena and is located at https://archive.indiaspend.com/cover-story/jobs-decline-in-indias-biggest-employment-arena-58440. Employment in the informal sector, the biggest provider of jobs in India, has declined 6% from 2004-05, according to government data. Coming on the heels of a Indiaspend report of a slowdown in formal-sector factory jobs, this is a disquieting trend because the informal sector provides employment to 72% of India’s workforce. These are also very vulnerable people because the majority receive no social security, health insurance or related benefits—and nine of ten workers do not even have written contracts. About 340 million of a total of 472 million people found jobs in the informal sector at the end of 2011-12. Roughly 12 million Indians seek jobs every year, but no more than 11.6 million find employment. 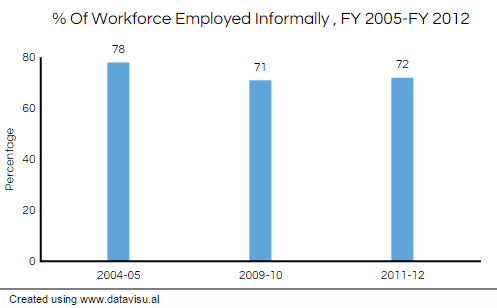 At the all-India level, nearly 78% of the total workforce was employed in the informal sector in 2004-2005 while the proportion was about 71% in 2009-10 and about 72% in 2011-12. The informal sector consists of proprietary and partnership enterprises (excluding those run by non-corporate entities such as co-operatives, trusts and non-profit institutions), in the non-agricultural sector and agriculture-related activities, excluding crop production, according to the latest report by the National Sample Survey Organisation of the Ministry of Statistics and Programme Implementation. Within the informal sector, the non-agriculture sector employed about 86% of informal workers in rural areas and 98% in urban areas. The non-agriculture sector employed 95% of urban females and 99% of urban males, and so is the biggest employer. In rural areas, the sector employed 94% of males and 63% of females. This reveals that the non-agriculture sector is increasingly providing employment, especially to men,in rural areas. The non-agriculture sectors that provided the most jobs were manufacturing, construction, wholesale and retail trade, transportation and storage. Manufacturing and construction in the rural areas provided the most jobs. While construction provided the most employment to rural males, manufacturing employed nearly 36% women in rural areas during 2011-12. In urban areas, retail provided the highest employment in the informal sector with 28%, followed closely by manufacturing. 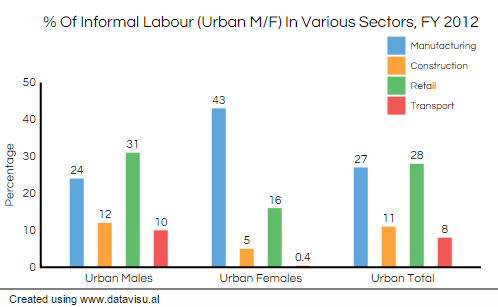 It also provided the highest employment among urban males(31%), while manufacturing provided the highest employment for urban females (43%). Written contracts.Pensions.Health insurance. What are those? Most workers in the informal sector do not enjoy any benefits, with casual labourers among the most exploited—Almost 97% work without a written contract, and 93% do not have social-security benefits, such as pensions or health insurance. 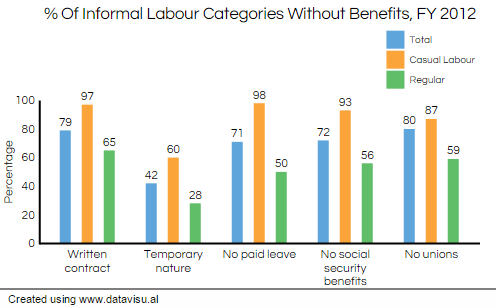 Let us look at the sector-wise data on benefits offered to informal workers. Construction seems to be the worst employer in rural areas; more than half the employees enjoy almost no benefits. 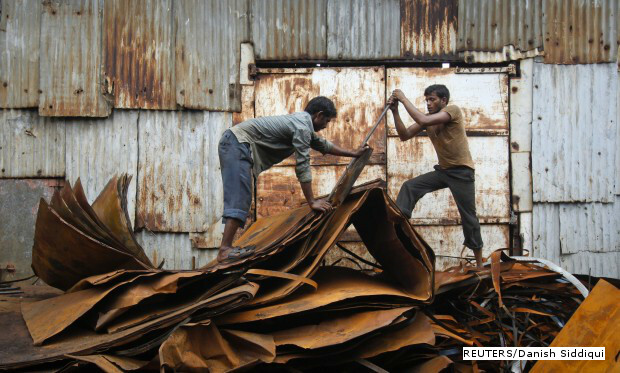 In urban areas, more than a quarter of informal sector employees enjoy almost no benefits in manufacturing industries. The discrimination against women is evident. The average salary per day was about Rs. 258 per day for men in the informal sector in urban areas. Women got Rs 194. In rural areas, men got Rs 189 per day, while women got Rs 121. IndiaSpend had reported that while Prime Minister Narendra Modi pushes his Make-in-India manufacturing plan and factory output rebounds, new data indicate two disquieting trends. One, there is a slowdown in employment in the formal, organised sector (which in any case employs only 12% of India’s labour force), the prime staging ground of Modi’s programme. More than 400,000 people lost their jobs during the financial year 2012-13, according to government data. Two, this slowdown hides a larger, long-term trend: India Inc is automating and squeezing more output from its workers and so needs fewer of them.